Our water was off all day today, and none of the urgent printing that needed to be done, got done. I was at a complete loss with all my careful planning wasted. 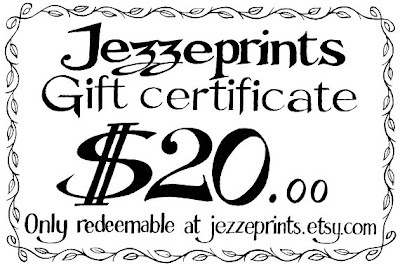 But luckily this gave me the chance to make gift vouchers for my Etsy shop! Please forgive the almost unbearable 'fontiness' of the design - clearly I needed to get something out of my system (and should probably look into drawing a comic sometime soon). Other denominations will be available shortly, perhaps even this evening. Yes, please! Draw a comic!